Weightlifting isn’t just a guy’s thing anymore. Nowadays, more and more women see weightlifting as a healthy form of exercise. Weightlifting tones up muscle while provides a defined look that many women (and men) strive for. With the types of results being seen inside the gym, it’s no wonder that weightlifting has become popular among women. And while women can lift weights just like a man, they’d benefit most from a specially designed weightlifting glove for women. 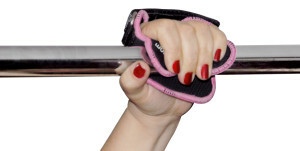 Why is it so important that you find a weight lifting glove for women? Because a woman’s hand is often times slimmer and smaller than a man’s. Not all gloves or grip pads will fit a woman’s hand comfortably. True, Grip Power Pads® grip pads are adjustable; however, we’ve noticed a great deal of women who still required something a bit more specific to them. That’s why we created our specialized Weight Lifting Glove for Women. Made from some of the most durable, moisture-combative material on the market, our weight lifting glove for women provides the type of cushion, grip and protection that any woman – or man – would want inside the gym. While working out isn’t necessarily akin to a fashion show, why should you have to wear unsightly, smelly and bulky workout gloves when you hit the gym? You don’t. 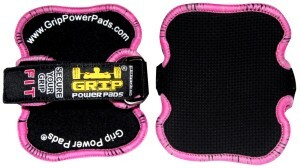 Grip Power Pads® meticulously designed our Grip Power Pads® Fit for both fashion and function. Our Fit model – just like our Grip Power Pads® Pro model, features a neoprene material that’s comfortable on your skin, as well as Velcro straps and a stainless steel metal ring, allowing you to adjust the pad to fit your hands. But what our specially designed weight lifting glove for women has, that the Pro does not have, is a beautifully stitched pink edging to ensure that everyone in the gym knows that you can workout in style. Most women, when they first hit the gym, flock toward the ever-popular workout glove to protect their hands. However, these gloves don’t really protect your fingers. What they do accomplish, however, is overheating your hand because of all that excess material. That excess material causes your hands to swell and sweat, making the gloves impossible to take off, not to mention pretty smelly and bacteria ridden. Straps, on the other hand, have less material, but they don’t protect your hands the way you expect. They’re also a pain to put on and take off. 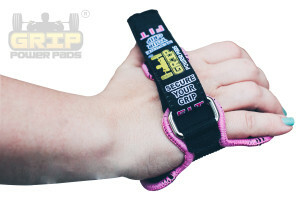 That’s where the Grip Power Pads® weight lifting glove for women comes into play. Our Fit model is easy for you to put on and take off, and is designed to protect your entire hand (palm to fingertips) without causing excess sweating and swelling. Nothing’s more beautiful than a woman with the confidence to hit the gym and demonstrate her commitment to health. But that doesn’t mean you have to sacrifice the beauty and well being of your hands. Every time you hit the gym, your hands take a beating. But they don’t have to. 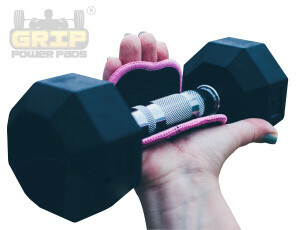 Grip Power Pads® weight lifting glove for women – the Grip Power Pads® Fit – will keep your hands protected during even your most intense routines.